Flat Panel Pros delivers home audio and the best home theater installations with stellar surround sound. Our experienced installers use non-invasive techniques to install nearly invisible wiring and speakers that are flush to the ceiling or walls, making them blend right in without distracting from your home décor. Our custom designs cater to your unique needs. Listen to music while entertaining on the patio, seamlessly listen to an audio book as you move from room to room, or stay current on the news and your favorite podcasts without the need of a earphones. You can do it all with our audio installation in Vancouver, WA and the surrounding Portland Metro area. 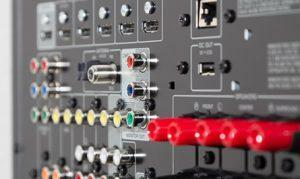 Our personalized audio or TV installation can break down specific rooms or areas of you home so they are on different networks. The kids can each have their own room wired for sound, separate from the rest of the house. The kitchen and dining room can be on another source, and the office on another. We offer both single-source and multi-source audio systems. Our team of friendly technicians works with you, listening to your specific needs and offering suggestions along the way. In the end, we design and install the perfect audio system, customized for your home or home theater. We go over the different brands and features, narrowing down the best system for your use. All our estimates are upfront and transparent, never any hidden fees! We have a reputation for excellence because we put careful consideration and well-developed expertise into every detail. See the difference excellent customer care and quality service makes. Call today to schedule a consultation for your audio installation in Vancouver, WA.